I would like to thank all of you who commented on the loss of my furbaby Missy. While her death was not truly a surprise, in the end it wasn't her leg, her back or her liver that was the deciding factor but her neck and that was a surprise, to me at least as she didn't have any signs of a neck problem until Tuesday night. But at that point I could tell it was a very big problem. The decision to put her to sleep was the right one and I know she is no longer in pain and hopefully she's up in heaven running around with Nicki, Willie and Poncho having a grand old time. She was a wonderful friend and will be missed by all who knew her. I know this next bit is old news by now, but I'm gonna tell you about my Market Experience anyway. Mary Ann and I were barely over the bridge from Nebraska into Iowa when we had to pull over and back up down the highway. No, we didn't lose something off the car, we didn't have a flat tire, nothing like that. What we did have was a Convocation of Bald Eagles! Mary Ann thought at first they were turkeys but as we went by them, I'm looking at these big birds and I'm saying, I don't think those are turkeys Mary Ann, they looked more like Eagles to me! By this time we were way past them and Mary Ann had come to the same conclusion as I had so we pulled over, waited for traffic to pass and then backed down the highway so I could snap a picture! There were actually about 7-8 of them but I could only get these 4 in the shot. I know, you can only see 3 in this picture but if you look closely when you click on the picture, you can just see the 4th eagle in the upper right hand corner. He took flight when we backed up. I think the tires crunching on all the gravel on the road scared them. Visited quite a few rest stops along the way too. When we arrived in Nashville, we happened upon a big antique show so naturally we had to stop and look around. 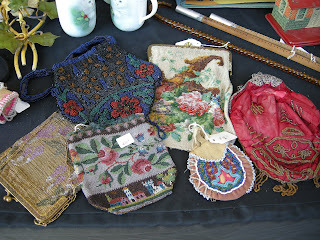 I didn't buy anything but I did see some beautiful old needleart and gorgeous old beaded purses. 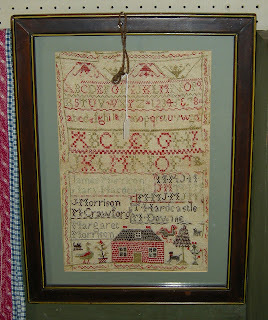 Most of the needleart was in frames pressed right up on the glass or had acid matting on them. It broke my heart to see that. I'd have bought them all up if they weren't asking an arm and a leg for the pieces! Most were over $500.00!! 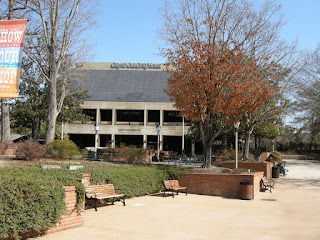 After we finished browsing the antiques, we went over to the Grand Ole Opry. I'm not sure what I expected, I just know the reality wasn't what I had pictured. When I showed Dan my pictures he said the same thing. Not what he expected either. We didn't take the tour of the backstage that they were offering. I'm sorry but $15.00 to see an empty building seemed a little high to me. I told Mary Ann she could go if she wanted but she decided not to. We thought about buying tickets to the show for Saturday night, Kelly Pickler was performing, but we decided we might be too tired from Market so we passed on that also. While we were trying to find the Opry House, we saw this sign that tickled our funny bones. Speed limit 24. Not 25. 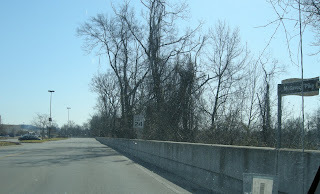 Speed limit 24. I've never seen that before. It could be I lead a sheltered life and that is normal in other parts of the country. But here in the Heartland it's always 25, 30, 15. Never 24. Before this becomes an epic novel, I think I will stop here and continue the story in my next post. I don't want to bore everyone just once, I want to bore you over and over and over! Wicked of me isn't it? In the meantime, please have a wonderful day and thanks for stopping by! Thanks for sharing pics and tales from your journey! Love the goodies you snatched up! Loved seeing pictures of your trip. I looks like you had a great time. Bald eagles! That's fantastic! Sorry you got lost in St Louis. 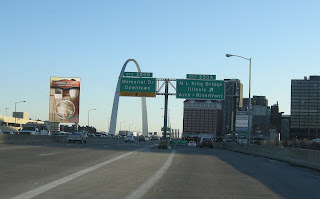 They're constantly closing exits and roads and whole freeways around here! Oh my gosh! Look at those eagles!!! They are supposed to be all around here, but I've never, ever seen them in the wild ever! Oh, I am so happy that you are sharing your journey with us. Not many people take time to drive long distances any more and miss all the things that you have shared. 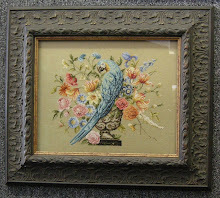 The eagles are beautiful and the findings at the antique stop are wonderful. And who would have thought of a 24mph speed limit :) I can't wait to read Part 2. Again thank you so much for taking the time and sharing your experience! Seeing the eagles would be awesome! And those purses are gorgeous! Is that the old Grand Ol Opry downtown or the one at Opryland?